I’m not much of a gardener. Although I love flowers and foliage, tending them has never been a task I’ve fully embraced. I’ve purchased many a plant with good intentions, placed it somewhere, and thought of it again only when I stumbled across its crispy remains. My plants generally have two options: Thrive against all odds or succumb to my neglect. Self sufficiency is key. I’m not hard-hearted; I’m just dependably forgetful. Pets and humans sound an alarm when their needs aren’t being met. The hungry screeching of a pet or a baby is a verbal cue to which we’re naturally attuned. Of course, trees and flowers don’t talk. It’s one of their greatest attributes. They speak in sign language, stretching their limbs and leaves in the direction of what they need, recoiling into themselves when they’re lacking, and blossoming triumphantly when nourished. The language of plants is fairly simple, but you have to pay attention. Earlier this spring, I looked at my little front yard garden every day with mild irritation. What was all that crap growing out there? What was up with all that broken glass? What percentage of my soil was actually cat poop? I had no answers to these questions. All I knew was that my garden was unsatisfactory, but the idea of taking action seemed ambitious. I prefered to glare at it and shake my head disapprovingly. Then one misty, grey spring day, anxiety got the best of me in a surprisingly productive way. It had been a stressful week, and tension was lacing its way through me, tingling up my spine, compressing my skull in a dull headache. As I walked down my front steps, an overgrown plant got in my way and I savagely ripped it out by the roots. It felt good. My blood pressure seemed to lower by a fraction, and in that second my focus shifted outside of myself and toward my disheveled garden. I studied it gravely. And then I drove to Ace Hardware. I bought some trowels and shovels, seeds, and bulbs, and set to work purging my agitation with handfuls of dirt and snapping roots. By the end, I was sweaty, smeared with clay-laden dirt, and feeling pretty pleased with myself. I’m no perfectionist, but the results were respectable. My front yard no longer resembled a marsh quite so closely, except for the alarmingly spongy lawn. I tucked seeds, bulbs, and sprouts into the earth, sprayed them with the hose, and hoped for the best. Not much happened for a couple months. Then gradually, tendrils began popping up here and there, unfolding and stretching upward. I monitor my garden pretty closely, pull up what I think are weeds, and try to decipher what it might be trying to tell me. It’s a daily exercise, a twenty-minute meditation that focuses my sprawling, sometimes frenetic thoughts. This contemplation sometimes even benefits the plants themselves. I’ll be honest: By horticultural standards, my garden is pretty lame. I can’t keep up with the weeds and I don’t think half of the things I planted are going to come up. What I planted and what is renegade remains mostly uncertain. My herbs maintain a tenuous grip on life, while my miniature roses teeter closer toward death with each passing day. 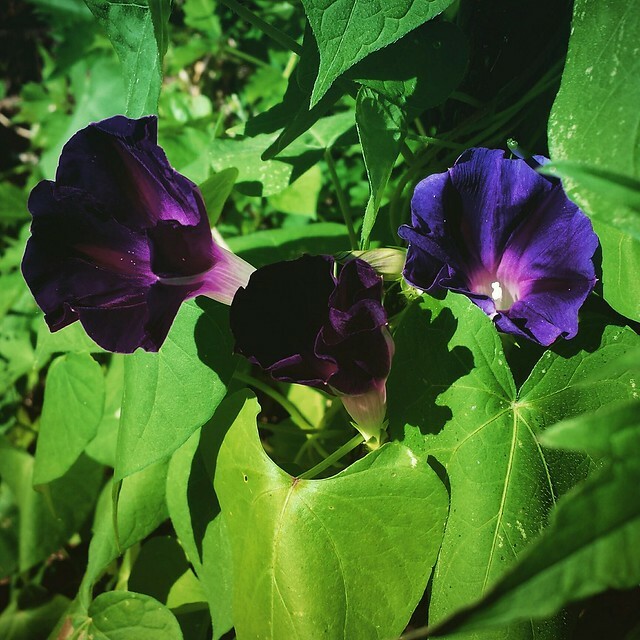 As I walked out the front door this morning, I noticed the bright yellow buds of some plant had unfurled and violet morning glories were opening toward the sun. I paused for a moment to snap a picture of this victory. The progress may be slow, but it’s there. And that counts for something.